In a joint operation by SAP 10th Battalion and the Forest Officials this was possible. We thank them for risking their lives and catching these culprit's. SAP 10th Battalion along with forest department have seized a highly sofisticated AK-47 rifle alongwith 46 live bullets and a rhino horn from 4 suspected wildlife poachers from Dooars area of Mendabari under Alipurduar District. 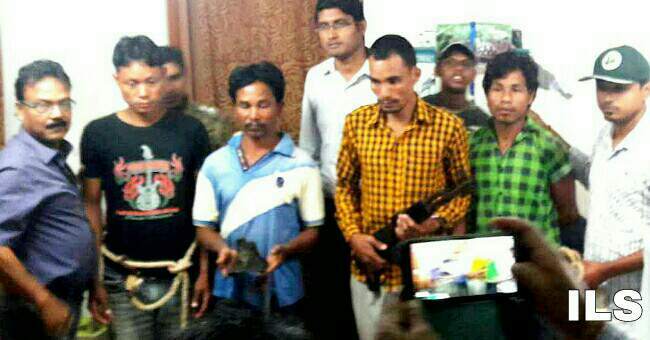 The arrests were made during a raid in one of the houses of Mendabari forest region. The 4 persons arrested have confessed to their crimes and have revealed that they used to work together in killing animals in Jaldapara forest regions and later selling off the animal parts. Police doubt if they are also involved in other illegal activities like kidnapping, extortion, robbery, etc. The rifle is said to have been procured from Assam.